Remember that movie “The Predator”? The alien that used infrared vision so he could easily detect Arnold Schwarzenegger and the other elite soldiers in the jungle? Well, if he were a little more docile and a home owner he’d definitely be using that keen thermal imaging to detect any hidden water damage in his house. It is easy to identify obvious water damage in the form of a wet carpet, or soft, discolored spots on the drywall or ceilings, but many times moisture in the walls accumulating from a slow leak cannot be seen with the naked eye. This water damage can cause structural damage or serious mold growth which can lead to life threatening health problems for you and your family. But now there is technology used by the best water restoration companies to identify any moisture in your home in a quick, highly cost effective manner that will guarantee your home is free of water related problems. This technology creates vivid images of the infrared spectrum that give an amazing “inside” view of a structure. Instead of focusing on the 450-750 nanometer range of a visible light camera system, the infrared camera takes pictures in wavelengths of 14,000 nanometers on the electromagnetic spectrum. The following are only some of the amazing detailed images that thermal imaging devices provide the user. Gone are the days of bashing through drywall to determine if there is water in the walls of your home. 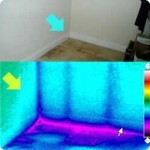 Thermal Imaging is the non-invasive high-end technology used by expert water restoration companies to determine if there is hidden water lurking in your home. The thermal imaging camera provides detailed real-time information revealing any hidden water damage that can be invisible to the naked eye. 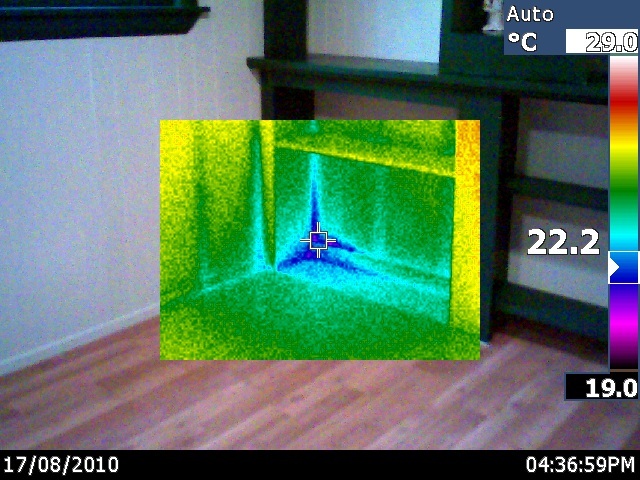 Thermal imaging cameras are an excellent tool to designed to detect water damage by assessing the moisture behind interior walls, in ceilings and under carpets. These cameras are also utilized to discover mold damage in your home by revealing undetected sources of moisture as well as detecting water soaked insulation in the ceilings caused by leaky roofs.